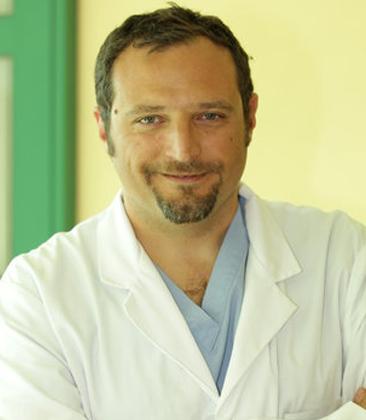 Dr. Silvio Danese is leading the team of the Inflammatory Bowel Disease Clinical and Research Unit in Humanitas. His team in Humanitas is one of the leading team internationally recognized in the field of inflammatory bowel diseases (Crohn's disease and Ulcerative Colitis) having an expertise of over 2000 patients followed up, of whom half with Crohn's disease and half with ulcerative colitis of any grade of severity. The team is composed by 15 scientists in the Research Lab, working on mechanisms of chronic inflammation, tissue modelling and reparation, and mediators of inflammation and cancer, and from the Clinical Research Staff, which is involved in all the aspects of patients' care from diagnosis to therapy, with a huge experience on new molecules still in clinical development. Moreover, the team is well known for the originality of the skills developed in the recent years featured by early diagnosis, prevention of complications and bowel damage, and new noninvasive techniques for inflammatory bowel diseases. The team in particular is a worldwide-recognized leader in the use of magnetic resonance imaging and small bowel ultrasound for Crohn's disease, and for early treatment strategies with conventional and experimental drugs. The team collaborates in a multidisciplinary setting with IBD dedicated surgeons, psychologists, nutritionists, and radiologists. It is also involved in several international research projects with the top level IBD Centres in Europe and United States. Actively involved in the development of innovative pharmaceuticals for Crohn's Disease and Ulcerative Colitis at international level. Took part in the new Italian and European guidelines on the treatment of Crohn's Disease and Ulcerative Colitis. Over 1500 patients affected by these pathologies are being treated at the Center in Humanitas.